Test, Test, Test! If you’re going to go to the trouble of setting up a plan, at least make sure it works! An IT professional can check monthly to make sure your systems work properly and your data is secure. After all, the worst time to test your parachute is AFTER you jump out of the plane. 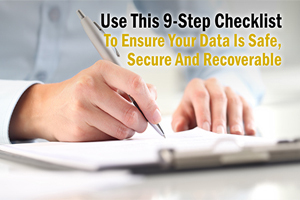 Be certain that you have all 9 steps fully covered with our FREE Disaster Recovery Audit. Contact us at 866-529-1568 or info@bridgenetllc.com, or visit www.bridgenetllc.com/disasterpreparedness/ to schedule our Disaster Recovery Audit FREE of charge, now through May 31. Contact us TODAY to get scheduled!